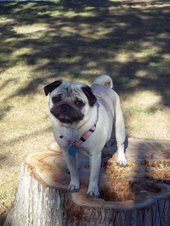 A place to keep tabs on everyone's friend: Lilly the Pug and see where an adventurous pug gal from Western Washington finds herself in her day to day and throughout The Road of her life. Olympians don't go out in the cold- unless of course it is cold & RAINY, then you get lots of people out in gortex. Ducks don't like being stared at in the morning. Camera flash is only good for close in pictures. Herons are sometimes very close to shore. Herons look less like pterodactyls when in the water than when flying overhead. We like to break the law. No Leash for us! Yes, that is right, we are outlaws. But we were forced into to it! There is not a single dog park anywhere within Thurston County or any of its cities: Olympia, Lacey, Tumwater, Yelm, Tenino, Rainier. 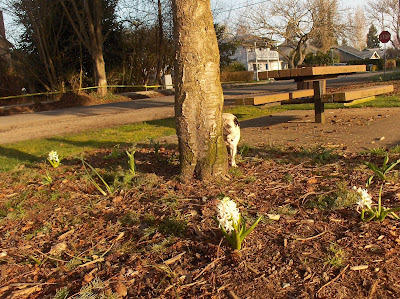 If my dog wants to go sans leash- we have to break the law, or drive to neighboring places, like Centralia or Steilacoom. Silliness. If you think this is ridiculous, please tell the City of Olympia during the November 20th public workshop for the Olympia Parks Plan. Great information is available at SoundHounds website too! LOL @ "Breaking Bad News Cutely"
We got to enjoy one of those crisp, clear, blue skies morning recently, so out we went for a cuppa at the coffeeshop and a walk through the park. Flowers, squirrels, and lots and lots of twittering birdies accompanied us. Here is our new friend Leo. He stayed the night while his humans went for a visit. He is a puppy. A Young Puppy. Which means he cannot stop moving or investigating. But he is quite smart. He figured out the Doggy Door! I think he may have even figured 'why' to use the doggy door. It also means the cat-monster Louis is very offended by his existence. But Leo is young and bounces back from being stalked and cornered (and then rescued) and is happy to just be here. And doesn't hold it against said cat monster of course. 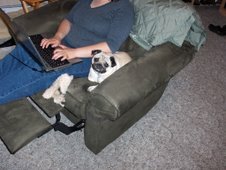 He is also 'handy' and likes to play whack-a-pug, which Lilly is not so thrilled with. But they have found they rambunctious play is something they both very much agree on. Running, jumping, snapping, sniffing, etc. In fact, go here to see them at play in the Park. They also agree on cookies.